This latest CX-5 features a ten-model UK line-up with SE-L Nav and Sport Nav trim levels. Prices start at £23,695. The choice is between a two-litre petrol unit of 2.0 litres and 165hp or two versions of the 2.2 diesel with either 150 or 175hp. The petrol unit is supplied with a six-speed manual gearbox and two-wheel-drive only, the diesels with manual or auto transmission and two- or all-wheel drive. Why is it called the CX-5? Nobody from the UK Mazda offices seems to know. Perhaps it is the word “Sports” in the description of an SUV, a Sports Utility Vehicle. It certainly is quite sporty, but unfair to use the word “Utility” for a car that is real quality with Dynamic Stability Control (DSC) and Traction Control System (TCS), full climate control, a 7in touch-screen display and a rear view camera on even the most basic model. Mazda quotes 9.4sec 0-62mph for the diesel 150ps manual version, and 56mpg (combined) in terms of fuel consumption. Mazda chose Inverness for an early June press launch to which BTN and its editor in chief were invited. 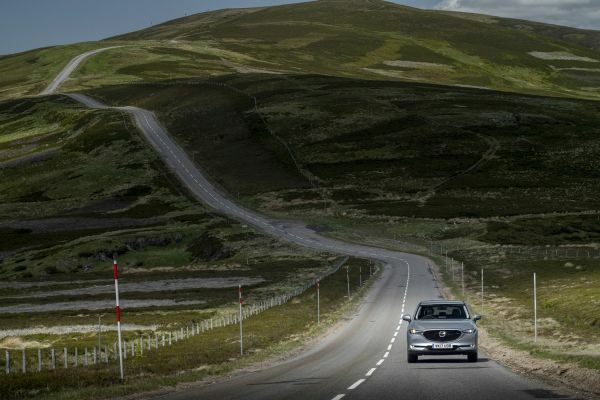 What was on offer was a near-250-mile route with a night stop, much of it via the wonderful scenery of the Cairngorms National Park. Mazda publishes a splendid quality book, Drive Together, which not only tells of the heritage of the marque but also offers a selection of holiday driving routes. Pop in to your local Mazda dealer for a copy. There are some fine suggestions of where to go touring in a motor car. 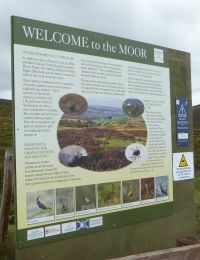 Sad to say, a route in this part of North East Scotland is not included. And next time around, total mileages per route too, please Mazda. Launched in 2012, the original Mazda CX-5 without doubt changed perceptions in the compact SUV segment with its combination of style, driving dynamics and efficiency. It now accounts for roughly 25% of Mazda’s global sales volume. Over a five-year period, more than 32,000 current-generation CX-5s have been sold in the UK. Meldrum House and Golf Club, not that far from Aberdeen, provided the night stop. On display was the previous CX-5, an opportunity for comparison, perfect for someone not acquainted with this particular model. On hand was UK managing director Jeremy Thomson to explain things: “It’s what we leave off rather than what we put on,” he said. The exterior look hints at the future direction of the Mazda’s ‘Kodo – Soul of Motion’ design language. The changes seem to have effectively decluttered the car with a pleasing effect on the eye. Compared to the Mk1 CX-5, the new car is 10mm longer and 35mm lower on the same 2,700mm wheelbase, but the big change is in the windscreen pillars. These are 35mm further back, which gives the car a sleeker look while surprisingly not affecting the interior space. Comparing the two, one can see how Mazda has moved on in five years, particularly in respect of quality. It is clear to see the use of better materials, including lots of soft-touch plastic, wood and leather. It seems there was criticism of noise in the previous CX-5. Some 50kg of sound-deadening material has been added, as well as such simple measures as moving the windscreen wipers down slightly to tuck out of the airflow under the rear lip of the bonnet. On speeds up to the legal limit, all models were very quiet with no wind roar. I managed fairly lengthy runs in both power modes, and a short burst (30 miles) after the overnight, in the powerful top-of-the-range automatic diesel. It really comes down to personal choice, as they are more or less as quiet as each other, the pick-up with the petrol version marginally better. In the Cairngorms, the petrol-powered cars seemed just that little bit brighter but the diesel will prove to be more economical regarding fuel for big millage users. One of the reasons for buying a SUV is the space and here you will not be disappointed. A powered rear door helps too. The car is very easy to load with the rear load area offering 506 litres, expanding to 1,620 with the back seats dropped. Under the floor there is another 30 litres. Among the nice touches is a simple navigation display in front of the driver and a glovebox that will take a 10in tablet. The steering is accurate, while the suspension was particularly suited to the Scottish roads with little body roll in corners, and the ability to soak up the bumps and road imperfections. However, no potholes every few yards in this territory. True they don’t get the pounding that is the case down south, but the rain, and particularly the frost, is much more severe. What is the answer, England? How to summarise a car pitched into one of the most competitive markets including the top selling Nissan Quashqai, Ford Kuga and Toyota RAV4? As a very smart looking car for the school run, it will do very well, the roomy interior ideal for fidgety passengers. The upholstery looks tough. It’s a crossover and you are high up, always a plus for safety. 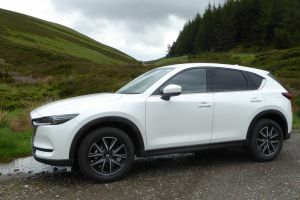 Once on the run, the CX-5 is smooth and relaxing, our 250 miles over some undulating territory not proving tiring at all. Which comes back the MX5 of one’s youth. It’s that lovely smooth six-speed box again. One can dream of times gone by, or a future with the children away from the nest and back to a two-seater.